One thing is for sure when you are a craftsman- you can never stop learning. For me that's a big part of the fun: learning new techniques or processes to create new forms, or simply to streamline production. Vacuum-press gluing isn't exactly a new invention, but it sure is new for me. 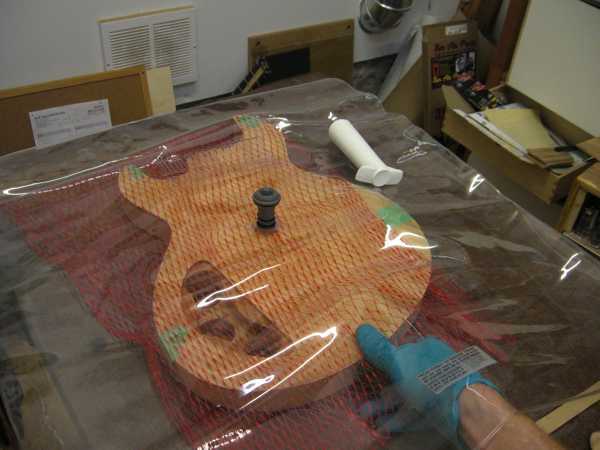 Using the inexpensive RoaRockit kit (originally made for skateboards, but usefull for all sorts of stuff), I'm able to do a better job laminating multi-layer guitar bodies. I start with a core of lightweight butternut wood, fully cut and sanded to the final ouline, and with control cavity cut out. 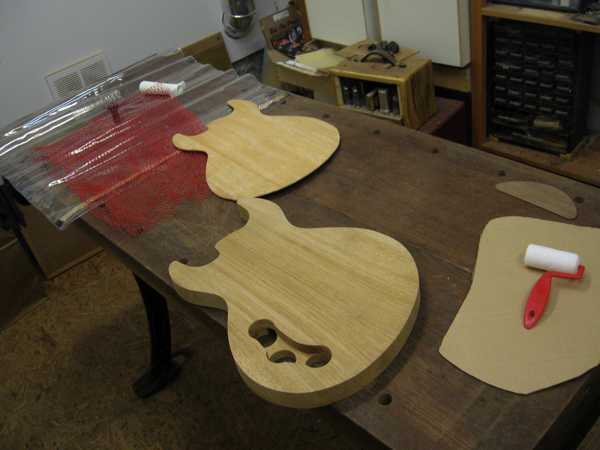 On the front and back will be applied "skins" of 1/8" thick birdseye maple. What I didn't get a picture of are two more layers. In between the core and skins are sheets of heavy, acid-free black paper. They absorb excess glue to become hard and fuzz-free. 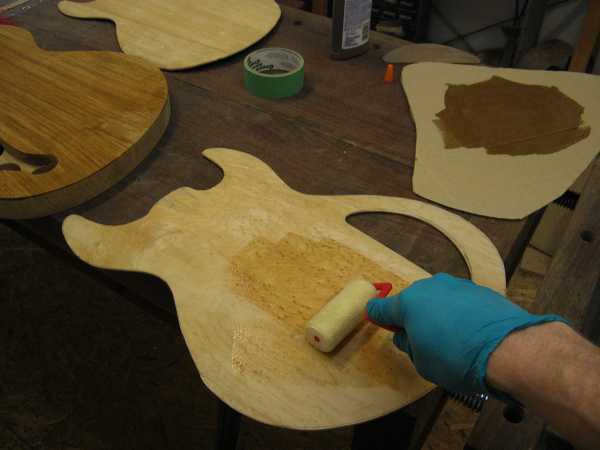 When finished they'll show up as thin black lines around the edges of the instrument. In this shot I'm applying epoxy resin with a disposable roller. The bag gets sealed with a very gummy tape, and then I pump the air out. By removing air from the bag, atmospheric pressure squeezes the parts together evenly on all sides, making a very consistent glue joint beween layers. The red netting ensures that air can travel around the object being glued so it can reach the pump.That little pump and valve system was originally developed to remove oxygen from wine bottles for storage- seems like less trouble to just finish the bottle, if you ask me.